Oryspa patronage is totally rewarding, I buy the products that I like, enjoy their benefits, and enjoy freebies (discounts or free products) to boot. Some of its products, I already couldn't live without, and the list just keeps getting longer. 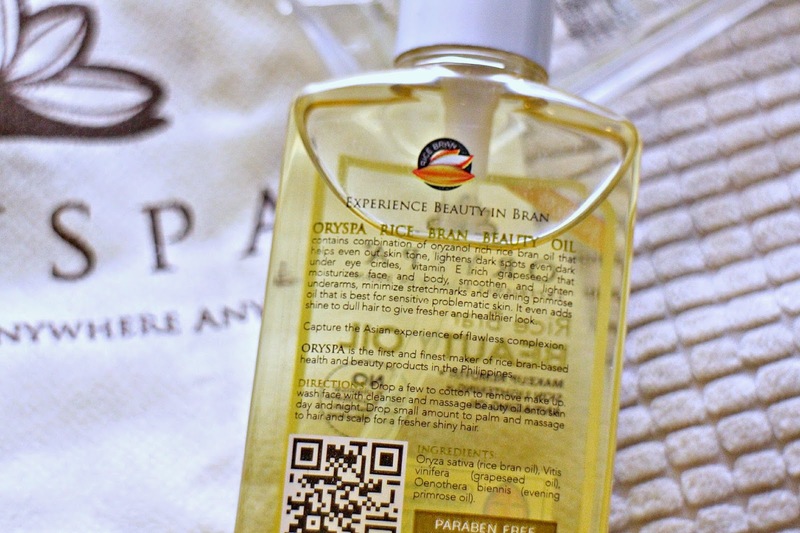 Included now in my list of must-haves is the Rice Bran Beauty Oil. Oryspa Rice Bran Beauty Oil is a multi-functional face/body/hair oil that works as a makeup remover, skin lightening and as a beauty oil with reinforced anti-aging benefits. 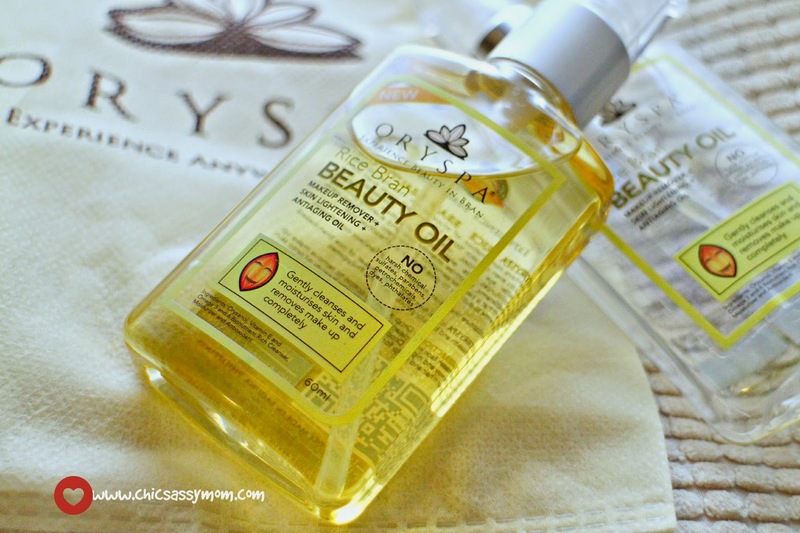 Oryspa Beauty Oil sells for Php 185/60 ml bottle. Oryspa Rice Bran Beauty Oil contains combination of oryzanol rich rice brand oil that helps even out skin tone and lightens dark spots even dark under eye circles and discolarion on underarms. It contains Vitamin E rich grapeseed that moisturizes face and body, smoothens and lightens, minimizes strechmarks. It contains evening primrose oil that is best for sensitive problematic skin. It even adds shine to dull hair to give fresher and healthier look. Since I already have a dedicated skincare regimen in place, meantime, I use the beauty oil as a makeup remover. It's my go-to waterproof eye makeup remover. It cleanses gently, without the cloudiness. Plus, I actually feel and see that it also nourishes my eye lashes, keeps them falling out and it hastens regrowth for thicker and fuller lashes. Take a look at how it works effortlessly in removing eye makeup. Oryspa Beauty Oil gently removes mascara, eyeliner and heavy eyeshadows too. Side story on my funky eye makeup. Yesterday was my company's 50th anniversary #RMK50, I was one of the performers, we did a 90's dance medley (oh yes, Macarena, Shalala, Barbie Girl, Can't Touch This, Mambo No. 5 and more). We had a matching hair and makeup. I will try to do a post on it too, it's so much fun! Back to Orypa Beauty Oil, for removing eye mascara and eyeliner, I use a cotton swab. It works like a wand and it's more targeted, plus it's more economical. What I do is I dispense a little oil on my palm and dab the swabs. At times, I use it also to remove bb creams, foundations and what have you, cleanses squeaky clean and no break outs. Although I have yet to see how it will fare on the minimizing-the-stretchmarks-part, because with so much (countless, as in mass nouns) stretchmarks to remove (so bad! so sad! ), I will need a whole lot more of it. A litre-pack, perhaps! Aissh! Beautiful Sunday! ^_^ Hope everyone is having a fabulous weekend. Well, mine, yesterday was so-so. The not-so-good part, some of it, I couldn't help but vent out on Twitter, plus I had a terrible headache to boot. Worst, son is still not feeling well! Oh well...life of a drama-filled supermom, aja, aja, fighting! ^_^ #Sundate later. Anyhow, yesterday was not all that bad. After doing my errands, I had good staycation, and I slept early and long (earliest and longest in yearsss...Yay!^_*). Icing on a happy weekend is a beautiful package from Myra E. Thank you! So now, I'm recharged! Let's talk about beautiful stuff. While I'm on to a good start of having a devoted skin care routine, studies show that facial creams and lotions are not enough to keep your skin look beautiful. For that healthy, young-looking and glowing skin, the holistic skin care also comes with having enough sleep (beauty rest), exercise (my biggest challenge! ), lots of water (super love the Kor water bottle, which is perfect for infused water, thank you! ;-D), eating well (aha!) and taking Vitamin E.
Beautiful skin starts from within. Enjoy the goodness of Vitamin E with Myra E.
Mine and Hubby's...our dose of nutraceuticals everyday (D3, Biotin, Flaxseed Oil (Omega 3-6-9), Multi-Vitamins, and now with Myra Vitamin E). Joining the esteemed rosters of Myra E brand ambassadors are Judy Ann Santos-Agoncillo and Sarah Geronimo. 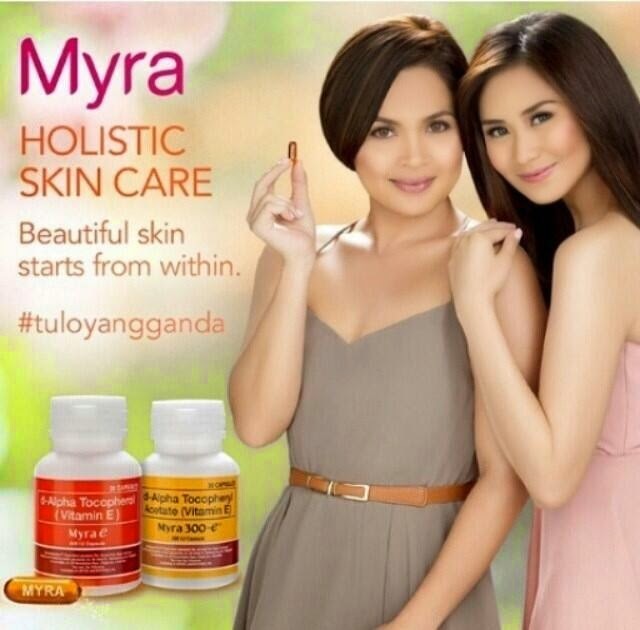 Judy Ann Santos-Agoncillo and Sarah Geronimo for Myra E Holistic Skincare. 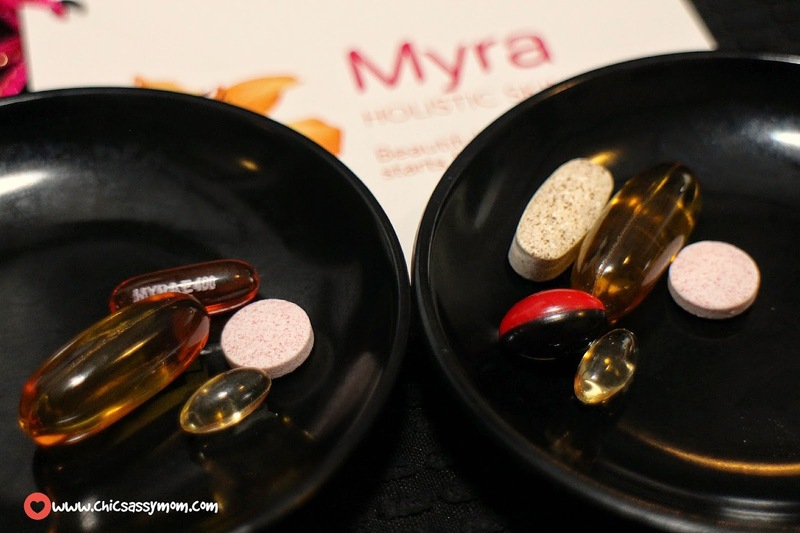 Myra 300E contains 300IU of Synthetic Vitamin E for Php 241.50 per bottle of 30s. 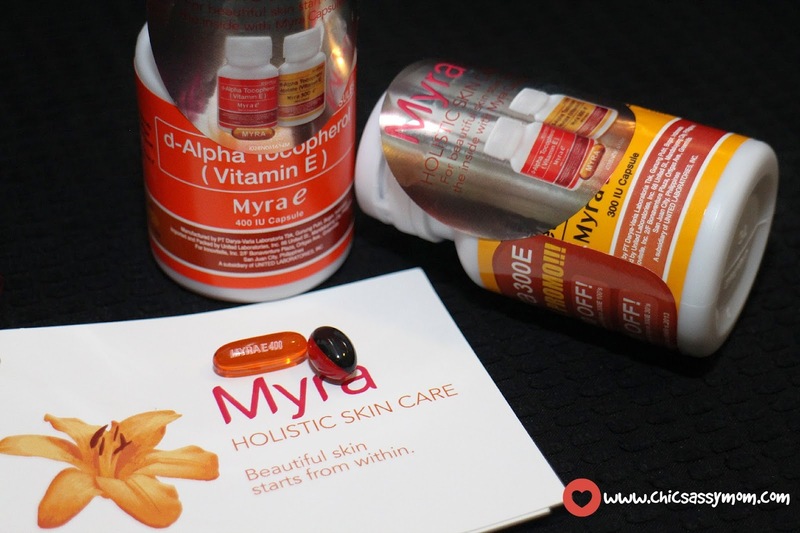 Myra 400E contains 400IU of Natural Vitamin E for Php 354.90 per bottle of 30s. 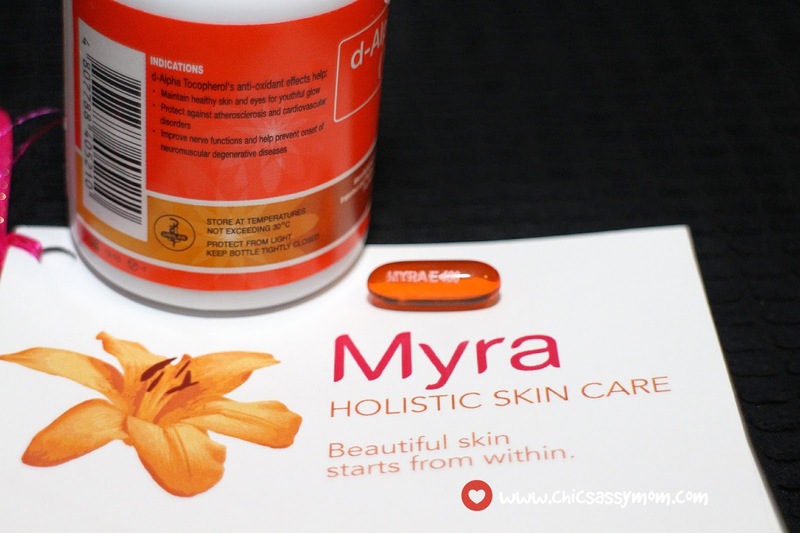 Myra E is available on leading drugstores, supermarkets, and department stores nationwide. For more details, follow and like Myra Philippines on these following social media networks. Annyeong! ^_^ Yay! Oh goodie, another Lee Min Ho Innisfree post. Here's another Seoul-ful haul of my basic skincare must haves, which are from the Innisfree Bija (formerly Jejubija) Anti-Trouble Skin Care line. I devoted so much to it lengthily here and here too. 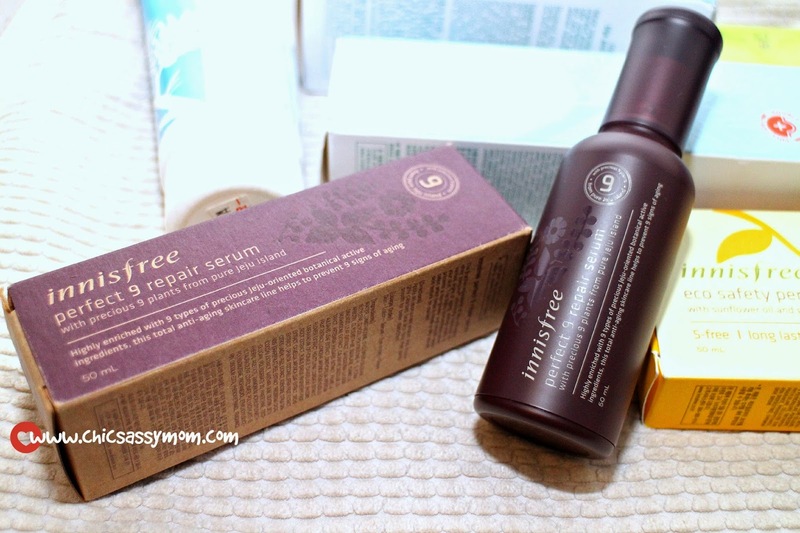 I'm loving the Innisfree Perfect 9 Repair Serum. It's lightweight, plus it leaves a silky feel and finish. It boasts of precious 9 plants from Jeju Island (Oh Jeju, I hope to visit soon! ), which offers aplenty of age-defying benefits. Love it! Just in case you're new here, before it's Skinfood, Skinfood, Skinfood, then I met Lee Min Ho err Innisfree, and fell head over heels in love. Fangirl aside, Innisfree skin care lines are well suited to my skin type, plus are generally well priced (when in Seoul). I stick by the Bija Anti-Trouble Line, and add a serum or cream for reinforcement, the more, the merrier! I will try my very best to do a full review of the Perfect 9. 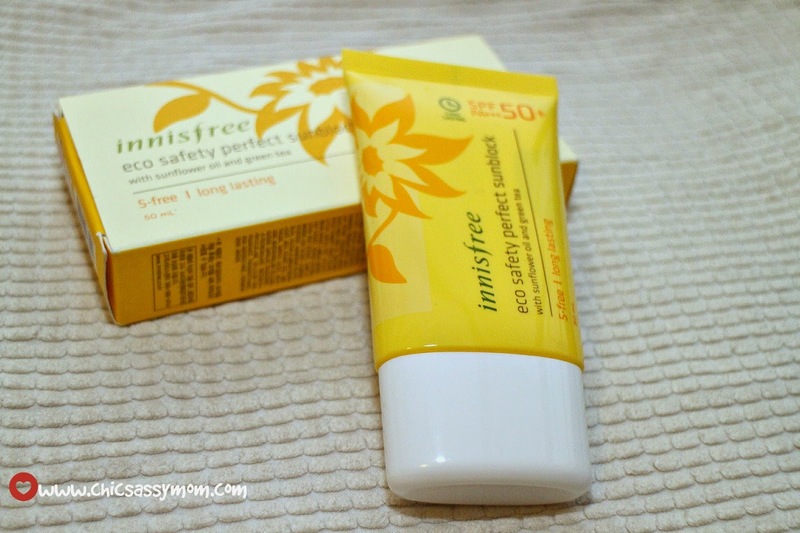 Innisfree Eco Safety Perfect Sunblock SPF 50+ PA +++ for 12000 KRW. I usually asked friends to get them for me in Seoul. Last time, I got them in Hong Kong (lucky them, Innisfree is in Hong Kong). 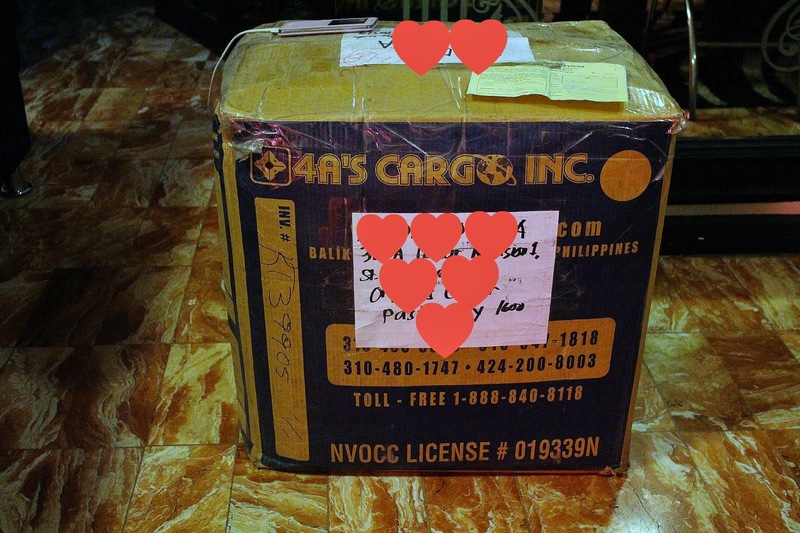 Or it's via my fave Korean e-Bay seller, BHappywithme. This recent haul was c/o my friend who went to Seoul. 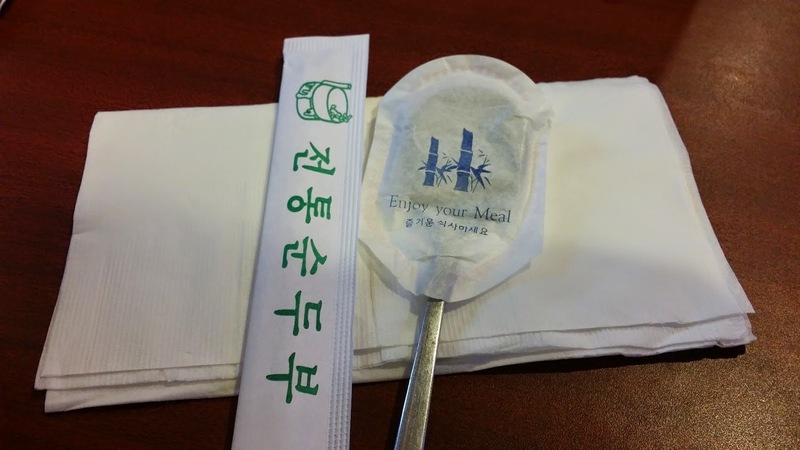 Kamsahamnida chingu! Happiness. Open. Share. Coke is it! 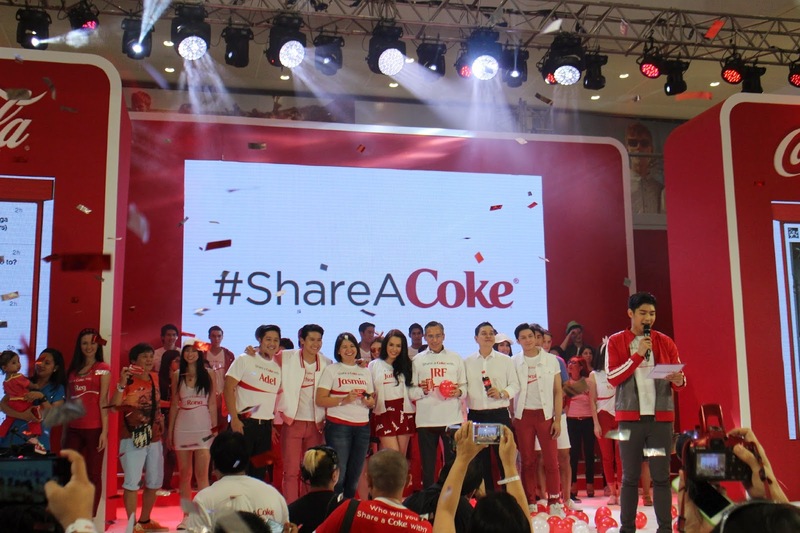 The phenomenal Share a Coke campaign that has taken over 50 nations by storm is finally in the Philippines! Yay! 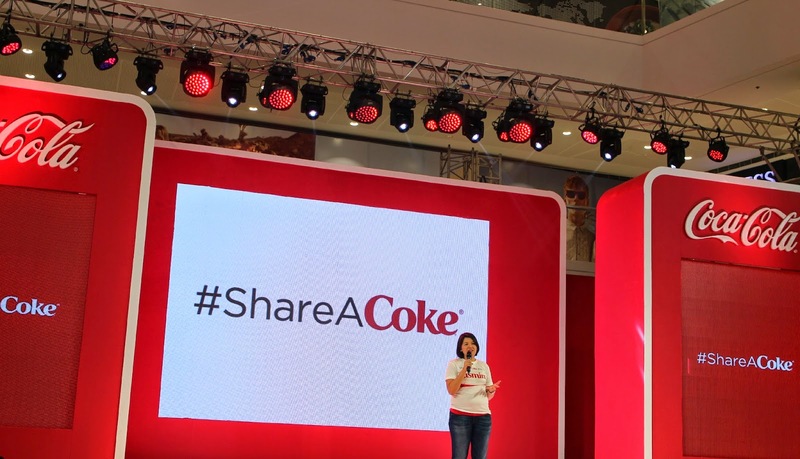 ^_^ The Coca-Cola Philippines #ShareaCoke launch was held yesterday at the Mega Fashion Hall in SM Megamall. 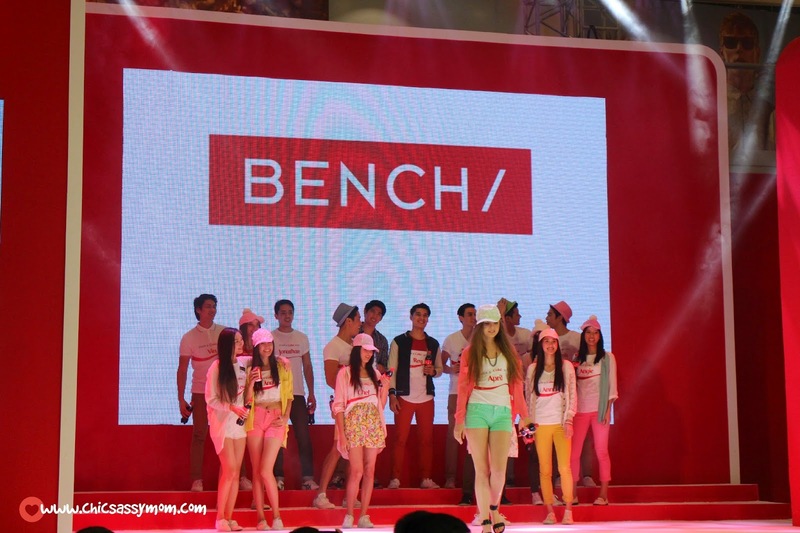 One of the event’s highlight was also to celebrate the long-standing partnership between Coca-Cola and the country’s leading teen clothing brand Bench. Mr. Ben Chan graced the event (and I took a photo with him ^_*, I just couldn't resist, he's such an admirable person plus Lee Min Ho had a photo with him, so me too! Check out my Instagram @chicsassymom *LoL). 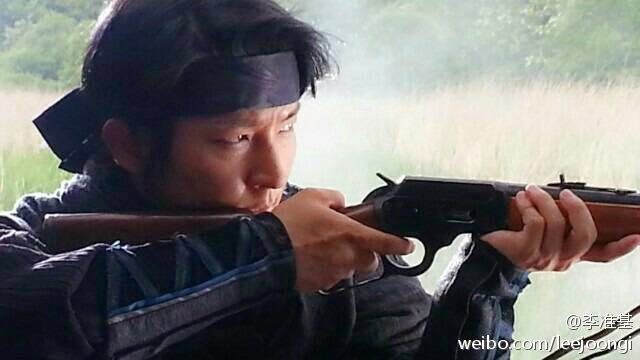 I have to commend him, as always, he was very, very prompt! 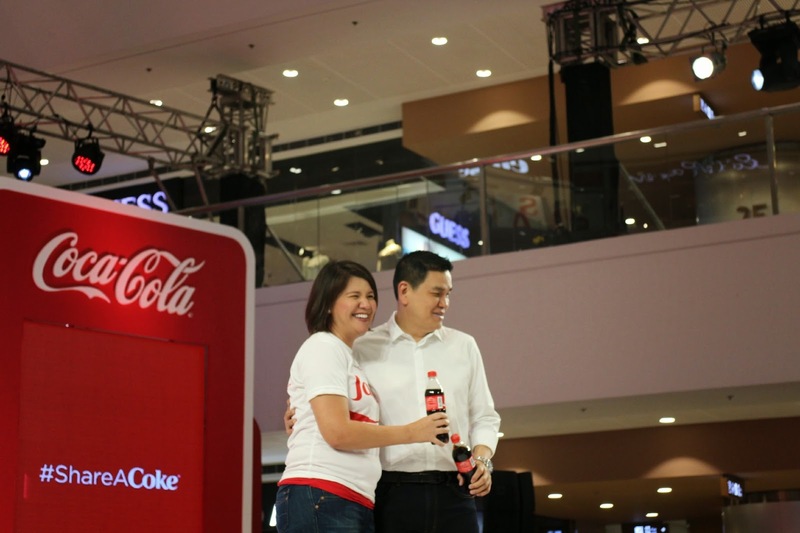 True to the essence of the campaign, to show the company’s appreciation for all the years they have worked together, Jasmin Vinculado of Coca-Cola Philippines shares a Coke with Ben Chan, Chairman and CEO of Bench. This was followed by a Bench fashion show, where models clad in stylized Share a Coke shirts showcased their personalized Coca-Cola bottles and cans on the catwalk. 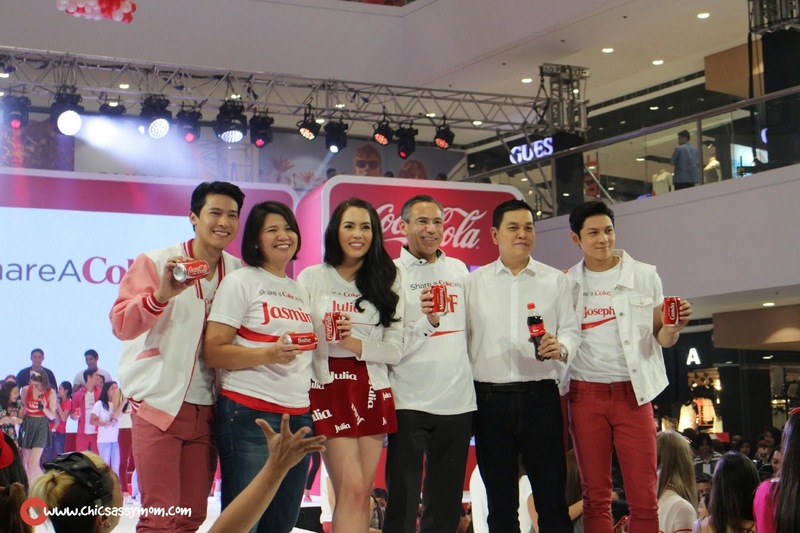 Celebrity Brand Ambassadors joins Jasmin Vinculado of Coca-Cola Philippines, Coca-Cola FEMSA CEO Juan Ramon Felix, and BENCH Chairman and CEO Ben Chan. It was a great day to share a Coke! The event was hosted by Robi Domingo. The Share a Coke booth allows you to create your unique 8-character name, subject to terms and conditions. Coca-Cola is a brand and a company that is close to our heart. 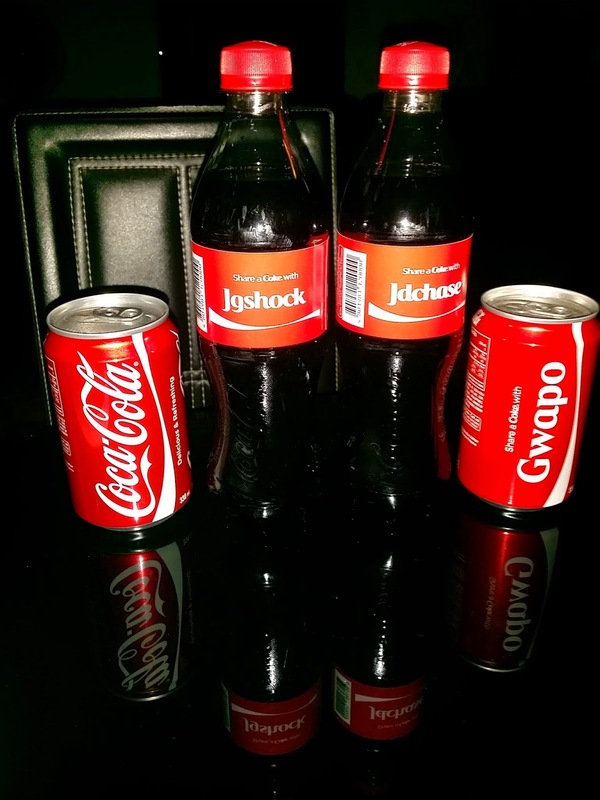 A couple of months back, hubby brought home a can that says #ShareaCoke with Gwapo (handsome). I couldn't agree more with it. ;-D Just imagine having your name on a Coca-Cola bottle, for sure, it's a bottle/can that will find its home to the display cabinet for life. Haha. Plus, I love, love personalized stuff, with labels and what have you...proprietary much. So we're all so looking forward on having our names or other form of endearments on a bottle too. Oh, which reminds me, do you know that you can have Coke delivered to your home on a weekly basis? I will tell you more about it soon. Meanwhile, we can't wait to build our collection of personalized Coke cans and bottles. Indeed, sharing has never been more fun and exciting with a personalized Coke can/bottle. More than the personalising factor, it is the sweet gesture of sharing and dedicating that makes this more meaningful. It is said, happiness is only real when shared, or happiness is best shared. ;-D Call it marketing brilliance, but as always, Coca-Cola continues to outshine itself with its heartwarming campaigns year on year . Start stashing your collection of personalized Coke packs available in sari-sari stores, convenience stores, groceries, supermarkets and even vending machines nationwide. 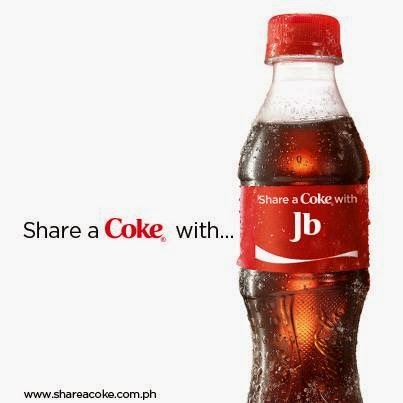 Check if your name is one of the several names already printed out in the market (Coke Cans, Bottles) by visiting the official site. It directs you to a Facebook application that lets you "Find a Name", and a whole lot more. 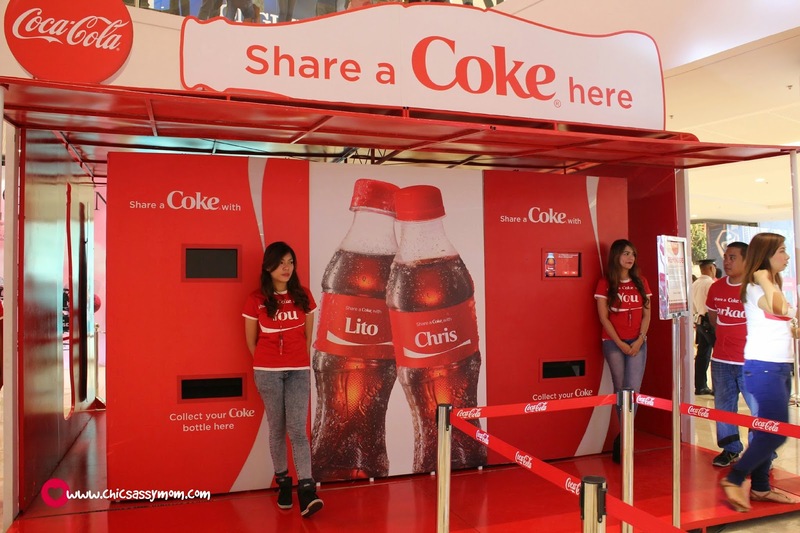 You may also drop by Share a Coke booths in supermarkets, malls and schools to have your own personalized Coca-Cola printed in an instant. Check out the links below for the latest schedule of the Share a Coke Bottle Printing Booth. 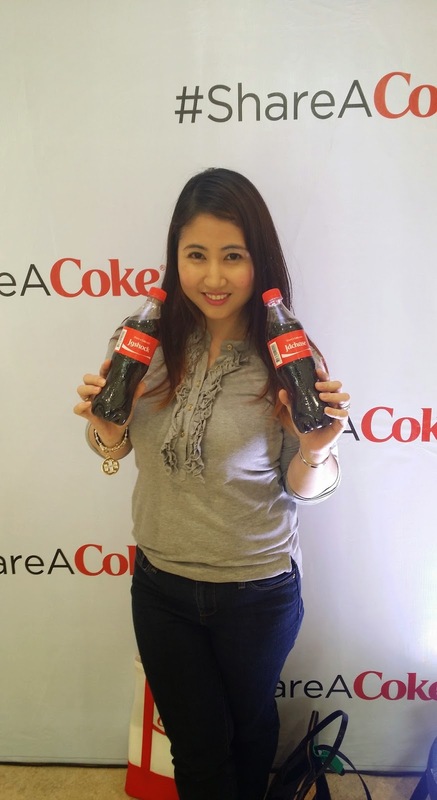 For more details, please check out www.shareacoke.com.ph. Hooray! 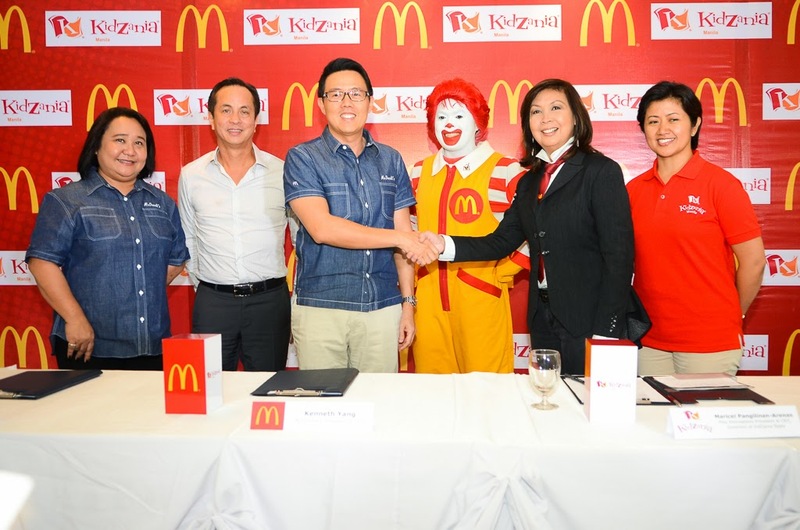 Happier days are coming as McDonald's Philippines and KidZania Manila inked their partnership to bring in more fun and excitement to play dates. Awesome, memorable experience designed to educate and to inspire kids to be their best selves awaits everyone. KidZania Manila is set to open at the Bonifacio Global City in 2005. 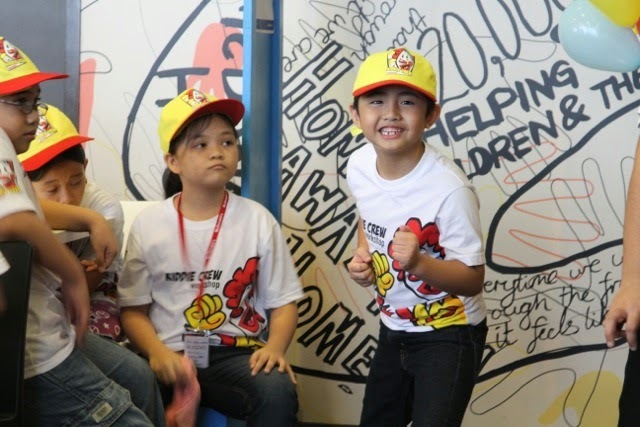 Like McDonald's, KidZania is already a well-loved brand by children in already many parts of the world. It is a place where kids can develop their skills, learn important values and meet new friends while having an awesome time. KidZania, headquaretered in Mexico, is an interactive kids’ city combining inspiration, fun and learning through realistic role play for children 3-14. One of the world’s most inventive, most awarded and fastest-growing kid’s edutainment concepts, KidZania has 16 locations in 13 countries as well as 12 new sites under development across the globe, including the Philippines. Somebody is excited to head over McDonald's Burger Shop in KidZania Manila...can't wait! Let's go! Taken during last time's McDonald's Kiddie Crew Workshop. For more information about McDonald's Philippines, visit the Official Website. For more exciting news about KidZania, visit www.KidZania.com, follow at Facebook.com/KidZaniaOfficial, or on Twitter @KidZania.